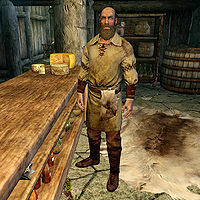 Hadring, a Nord warrior, is the proprietor of the Nightgate Inn. He has a tendency to talk too much, which may prove beneficial during the related quests. Hadring wears barkeeper clothes with a pair of boots. He carries some gold, an iron dagger, and a bottle of ale. He will greet you with, "Ah, hello there, traveler. Come to the Nightgate for food or lodging?" or "Need a room? Or maybe just some mead?" or "Something I can get for ya?" Hadring will also say, "Anything you need, just holler." When asked about his inn, he replies, "This old place? Been here forever. Built by my great grandda. Run by him, then all the way up the line to me." If you ask him about magic, he will state, "Seen enough magic in my day to know to stay away from it. I'd stay away from the Jarl's wizard in Dawnstar too. If you wanna be a damn fool, go to the College in Winterhold instead." You may ask him if he gets much business. He will reply with, "Nah, not so much. The odd traveler on the road. But mostly just old Fultheim, come to drink away a lifetime of bad memories, I'd wager. Course there's the Orc. Long-term tenant, that one. For what he pays, I could afford to shut this place down." This will allow you to ask about the Orc, and he will answer with, "Him? Oh... Ah, name's Balablob or Malaclob, one of them funny Orc names. Talks real good, though. Not a savage at all. Said he's a writer. Don't know what kind of job that is, but it must earn him some pretty coin. He's paid up for the next few months. He mostly just hangs about. Goes down to the lake, sometimes samples the stores of wine in the cellar. Man can do whatever he pleases, far as I care."